How Do I Stop Sleeping On My Stomach? It’s important for stomach-sleepers to know that this position applies mechanical stress to the cervical spine (neck). Muscles and ligaments are stretched asymmetrically to one side, which physically pulls the upper cervical vertebrae out of proper alignment. Among other things, this can cause chronic neck pain and headaches, and snowball into irreversible arthritic changes over time. So I’d like to describe some ways for you to train yourself how to quit sleeping on your stomach. It’ll take time – don’t expect overnight success. But patients have informed me they’ve made the change in as little as two weeks. For others, it can take up to six months. 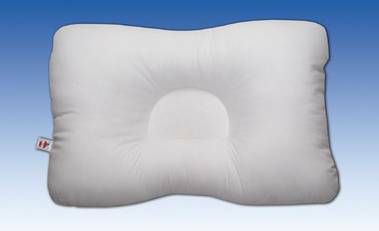 which are available for purchase thru our office at an economical price, are the most recommended pillows by the medical professionals who commonly treat neck and head pain. This is the easiest way, in my opinion, because it’s the “training wheels” of pillows. It’s uniquely designed to help you maintain back/side restful sleeping. The intelligent shape of it makes stomach-sleeping nearly impossible. There’s no question that it will wake you up if your body moves into the wrong position during the night. Our most requested ergonomically designed fibre-fill support pillow is made of a hypoallergenic, anti-microbial fiber that provides softer support and lasts longer than traditional pillows. The patented “D-Core or Tri-Core Sleeping Pillow” allows you to sleep on your back and/or side in the correct spinal alignment. This unique sleeping pillow incorporates two shapes into one pillow; designed to properly support the spine when people are back sleeping and side sleeping. Since most people sleep in the center of their pillow when they sleep on their backs, the patented “D-shaped” center is prized for its effectiveness to deliver great orthopaedic benefits; properly cradling the head and gently supporting the neck and upper back while back sleeping; helping to restore the natural curvature of the neck vertebrae and upper spine. When people sleep on their side, they sleep on the outside edge of their pillow, so both outside edges of this pillow are taller and designed for side sleeping. High resiliency fibre-fill springs back when compressed for exceptional comfort and durability, which allows for a supportive good-night’s sleep. This pillow also helps relieve tension headaches; reduce nerve pressure on the neck to diminish muscle stress neck spasms; arthritic neck pain and helps open obstructed airways that often cause snoring. The blended cotton cover is breathable and soft to the touch, and fits a standard pillowcase, 24”x 16” (61cm x 41cm). If you are new to a cervical support pillow, it may take time to adjust; this is the pillow working to help restore proper cervical curve during sleep. Most users experience a positive difference within days of using the cervical pillow, while others may require up to two weeks before their neck and back muscles adjust to their proper position. Suggestion #2: Solo sleepers have some creative ways to police their sleeping position. One method involves tying a ribbon around your wrist and anchoring it to a nightstand or bedpost. The theory is that “rolling over” will create a tugging sensation on the arm, prompting you to change positions. An alternative to this would be Velcro-ing a tennis ball to the front of your pajamas. The idea here is to make lying flat on your stomach unpleasant. Suggestion #3: “Will” yourself to stay on your back or side all night. This method is appealing because it doesn’t cost anything. It can be effective if you share your bed with someone who is a light sleeper. Ask them to nudge/poke if they notice you’ve unconsciously shifted onto your stomach during the night. 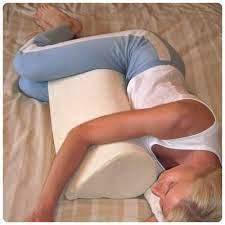 Using a knee wedge pillow, which is available for purchase thru our office, might help as well. office. Considered a “side sleep stabilizer”, this pillow is perfect for fully supporting the best (and most recommended) sleeping position - side sleeping; as well as for preventing and correcting the worst (and least recommended) sleeping position - stomach sleeping. It provides leg spacing & torso support for side sleepers. It’s lightweight, yet durable, open cell memory foam design allows maximum comfort to the user and optimum adaptability to all body sizes. It is designed to help stomach sleeper’s transition to side-sleeping. It’s pricey but worth it if you need the feeling of warmth, pressure, or support to fall asleep. s, back or side. It allows your body to relax in natural, comfortable positions while helping to relieve pressure and reduce tension in your shoulders, hips and back as you slumber, lounge or simply laze about. Whether you’re suffering from back pain, in need of pressure-point relief, or craving a more restful night’s sleep, this pillow molds to your body contours and adapts to your sleeping position. It simply helps to keep your body in the right position and posture in bed while you sleep. High-loft fibre offers huggable comfort and conforms to body contours for maximum support. It is perfect for pregnant women. This elongated full-body pillow is designed to be used in multiple positions offering just the right amount of support regardless whether you tuck it between your legs, lean up against it, or choose to sleep with it. This pillow is a fun and comfortable alternative to a sea of bed pillows. In addition to implementing these methods, I recommend receiving an evaluation from a reputable chiropractor who will review the overall health of your cervical spine. Improving spinal alignment can make the transition process from stomach-to-side/back more comfortable for you.